Hever Castle, Anne Boleyn’s family home, is still the home of Anne Boleyn’s Book of Hours which is said to be the earliest book owned by Anne Boleyn and which contains her signature and the signature of other leading members of the English Tudor Court, including Lord Cobham, who was one of the peers who sat in judgement at Anne’s trial. This Book of Hours, which was made in Bruges in around 1450, bears the inscription ” Le temps viendra”, “the time will come”, and Anne’s signature, “Je anne Boleyn”, beneath a miniature of the Last Judgement. There is also a drawing of an astrolabe, by Anne, to symbolise time. The British Library have done a podcast on this Book of Hours – click here to listen to the MP3 file and learn all about the Book of Hours from curator, Scott McKendrick. Alternatively, click here to visit the British Library’s podcast page to see all available Henry VIII podcasts. 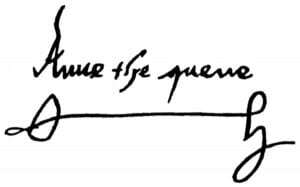 just wondering if there is a picture of the “le temps viendra” writting as i am considering getting it as a tattoo along with a falcon, and it would be amazing if i cud style it after annes own handwritting! let me know? There’s a photo at http://twitpic.com/btk1n – it says “Le temps viendra, Je Anne Boleyn”. If you’re an Anne Boleyn Files wiki member (http://theanneboleynfiles.wetpaint.com/), there is a closer up image in littlemisssunnydale’s profile. where can i find close up pictures of these writings im considering another anne tattoo and like michelle said it would be awesome to have her own writing!! I`m reading “The Six Wives of Henry VIII” by Alison Weir and it says that Henry gave Katherine a new year gift in which he inscribed in his own hand: ““If your remembrance be according to my affection, I shall not be forgotten in your daily prayers, for I am yours, Henry R., forever” and she later replied with: “By daily proof you shall me find To be to you both loving and kind”. I always thought that Anne wrote this. Can you please give me more details about this? 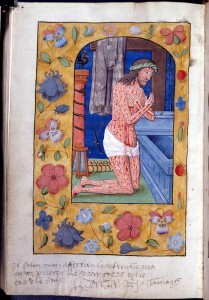 “Henry and Katherine’s inscriptions on her missal appear in the King’s MSS. in the British Library”. I found the reference to the missal that Nasim refers to, the one that Elizabeth of York owned, at http://www.bl.uk/manuscripts/FullDisplay.aspx?ref=Royal_MS_2_A_XVIII – scroll down to Royal MS 2 A XVIII, ff 25r-95v – and then at http://www.bodleian.ox.ac.uk/bodley/whats-on/online/workofone/theme1 – scroll down to “8. A royal psalter, Exeter College, MS 47 Gift of Sir William Petre (1506–73)”. There is a missal said to be owned by Catherine of Aragon at Leeds Castle, in the chapel, but that dates to 1527. I just haven’t been able to track down the page that allegedly shows this exchange of messages, and it is not the same reference Weir gives anyway. Unfortunately Alison Weir does not give a full folio reference. See http://www.bl.uk/onlinegallery/onlineex/henryviii/greatmatter/annebol/. The fact that this reference is “Kings Ms. 9, f.231v & f.66” (Weir refers to Kings MS) and is similarly worded to what Weir says makes me wonder if Weir may possibly have got confused. I’ve always wondered if the “flourish” under her signature means anything or osnprely decorative.